Today on Studio 5, I shared several album systems. 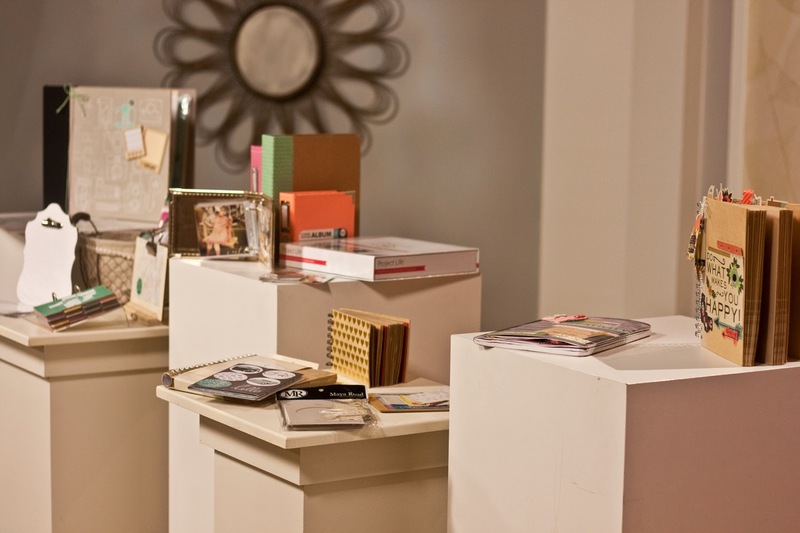 Everything from the traditional, 12x12 approach to scrapbooking to clever gift displays. I like all kinds of albums! GREAT segment & THANKS for this opportunity to win. You have such fun and creative ideas! Thanks Megan for all the adorable ideas. Being in OR, I miss the influence of Utah's scrapbooking community! Thanks for the recharge!! I'm an old school scrapbooker. My first scrapbook was Creative Memories and I've done everything in between. I do love full page and 2 page layouts and love incorporating project life style pages in for time sake. I do only 12x12 and some minialbums, but lately i have also been interested about heidi swapp memory files and smaller pocket pages, thanks for the chance to win. Love, love, love your segment!!! Thanks for all the ideas and info!!! Thank you Megan for the variety of ideas on using mini-albums! I love all kinds of albums but I tend to do a lot of minis bc I can finish them quickly! Love everything Heidi Swapp! I really like the traditional 12 x 12 and digital. However, the Heidi Swapp lines have really increased my interest in gift projects and mini albums. I also am loving Project Life. Always learning and trying the new opportunities in this world of memory keeping. Oops my post wound up as anonymous, 7/10/14 at 3:13 pm. Great show and very informative I would be honored to receive the giveaway. Oh my goodness!! Loved all the things you shared. Thanks for the chance!! I love all of your scrapbooking ideas and reviews! Thank you for the ideas on mini albums and the giveaway opportunity! Thank you! Great vibrant colors great ideas! Love your work. Fun segment. I mostly scrapbook 12X12. But other sizes are fun to try. Thanks. What a great giveaway! I mostly use 12x12 myself, although I started a 6x8 album with my daughter last summer that we've used to document her summers. I'd love to win some albums and be able to try some additional sizes! I've stuck with traditional 12 x 12 albums. I'd love to try some of the other sizes, especially some of the small mini albums. I have made albums different sizes,but my preference is 12 X 12. I am now starting to work on digital pages, but I still do the pages 12 X 12. I live your style of scrapbooking specially your craftsy class is one of my fav...thanks for the giveaway. I love the 12x12 3 ring!! I love all kinds of albums. There's no need to use them in the traditional way. You can take an idea and put it into motion with just about any album. Work outside your comfort zone and get your idea out there for others to see. I loved the segment… you sure covered it all and gave everyone hope of finding something that suits them… thanks for a chance to win!! Loved all the wonderful albums!!! Each has something to offer! Thanks for the chance to win"
Love a chipboard album....the possibilities are endless! I love the mini or art type books. The project life would be awesome but I don't have enough memories or pictures. Maybe a mini of that would be cool. Is there a way to watch Studio 5 online? I'm interested in what you shared. I've made a few minis - chipboard and album-style, but my go-to is the 12x12 album, with both traditional and pocket-style pages. The exception is my daughter's school album, which is 8 1/2 x 11 (but I wish I'd kept it bigger so I'd have more space to document!). Great segment on Studio 5! I like pocket scrapbooking and traditional 12x12 layouts! I enjoyed the segment! Thank you! I love hearing about scrapbooking! I love the 12 x 12 but really want to try some mini albums!!!! I just LOVE scrapbooking! My favorite is the traditional 12 x 12 album! Loved the segment! It was very informative and fun! I prefer 12x12 traditional scrapbooks. Thanks for the chance! I am expecting my first grandchild and excited to start some type of albumn for her! (Better than I did with my own) Thanks for doing the drawing! I prefer 12x12 3 ring albums. I love to change my mind on how I want them to look, and many times I don't scrapbook in order of events either!! Thanks so much for a chance to win!! I like to make it up as I go along. Pull colours and embellishments from other kits, make my own and try to make them meld together. I'm a bit chaotic but I always get there in the end. Thanks for this opportunity. I love all types of albums and think that each has a place in crafting. I'm getting ready to redo my craft room. I would love some new albums. I love making mini-albums that are shaped. They are so beautiful when completed and such fun to go back and view. Of course I also love the 12 by 12 traditional album because it gives you a lot of space to create. Thanks for the opportunity to win! Love your blog and all your creative ideas! I love mini albums, and yours are great! Thanks for the ideas. Loved your segment! And love Studio 5! I currently use Project Life and have never enjoyed scrapbooking so much!! Thanks for all the great ideas! Loved your segment on Studio 5! Heidi Swapp has my heart...I love the idea of using scrapbooking albums as home décor as well as memory keeping. Right now I am loving pocket style scrapbooking!!! I just wrote down a sketch of the page you did with the washi tape in the chevron pattern. I love that idea. And now I am a fan of your page. Thank you! Thank you for all the great ideas for scrap booking. Now to just get started. I think that I want to try the mini albums and Project Life. But I am willing to try all of the ideas. I pocket albums since I'm not the most creative people. It makes it look awesome without too much effort. Oh man! I want one of each of these. These are all wonderful! I like all kinds of albums, Thanks for the chance to win. Great ideas! I like all different size albums. I have not tried the newer pocket style yet... Thank you for the giveaway. I love albums of different sizes and even shapes. 'Love all of the inspiration and the chance to win some goodies, too!! Thanks for sharing some of your scrapbooks-like you, I do a variety....LOVE Heidi Swapp premade albums -they're so fun!!! Trying PL this year & so glad to be able to look back at this year & remember fun, little things that happened. Also LOVE Simple Stories-they make scrapbooking the bigger events in life so easy!! Thats what I use for travel and Christmas. I tend to be a plain and simple 12x12 post-bound album type of gal though I do occasionally use a 8.5x11 and a 6x6. Thanks for the chance! Small quick books are my favorite. Just found you at Creative Live, waiting on the 23rd for class. Thanks Megan for sharing the cool products and offering a chance to win. I really like digital scrapbooking in a 8x10 or 8.5x11 format. Thanks for the chance to win! Just discovered your blog through introduction by Creative Live--love your creative projects & these albums! Bookmarking you now! For myself I typically scrapbook a traditional 12 X 12 but for gifts I branch out into different and fun sizes. I love studio 5 but I get really excited when I see a segment with you! Just found you through Creative Live- so excited about your upcoming class! I like the 12 x 12 albums but also saw the instagram ones & I love the small sizes. Have to find your studio 5 session to watch -wonder if its just local? Thanks for doing the giveaway! I love all kinds of albums! Love the 4 x 4 albums! Please keep Instagram ideas flowing. Oh fun! Love the chipboard albums!!! Fun and exciting possibilities here! Thanks for sharing. I usually use the 12x12, 8.5 x11 and 6x6. Thanks for the chance to win. I am such a traditional scrapper i usually go for the 12 x 12 (have for the past 48 years). But I am trying to break out of that square...i love the new journaling and mini scrapbooks! I missed it, but want to try anyway. I love the project life albums! I like different albums for different purposes. For my personal use I prefer the 12x12 size but I am open to new possibilities, specially thinking about better use of shelf space. WOW! Megan you did a spectacular job on that class! I learned sooo much! Your creative mind is just inspiring! I am soooo going viral with this-- every scrapper needs this class.. talk about bringing us into the digital age of scrapbooking Your integration ideas were priceless. I'm the mom of a beautiful daughter and two crazy pups. I share my heart and soul with my handsome husband, Cory. Professionally, I write, edit, teach, and create. In the rare occasion I have some free time, I love spending time with family and friends. Shopping always makes me happy. Creating is a must in my world. And travel is something I fit in when time and budget allow. Crafting with Jars & a Cosmo Cricket Giveaway! The Instax Share Printer, Studio 5, AND a CreativeLive Camera GIVEAWAY! That's What She Said. Ethereal theme. Powered by Blogger.